Creamy and tender Risotto is an art form unto itself. The secret to great risotto is to enjoy the process by allowing the starches to release slowly, to create the creamy texture. Once you master this technique, the possibilities are endless with the wide variety of ingredients available year round. In a large, heavy saucepan, heat the oil over medium heat. Add the Arborio rice and stir until each grain is well coated with the oil and toast for about 5 minutes. Add ¾ cup of the spring onions. Add the wine and stir until completely absorbed. Add the simmering stock a ladleful at a time, stirring frequently after each addition. Wait until the stock is almost completely absorbed (but the rice is never dry on top) before adding the next ladleful. Reserve ½ cup stock to add at the end. 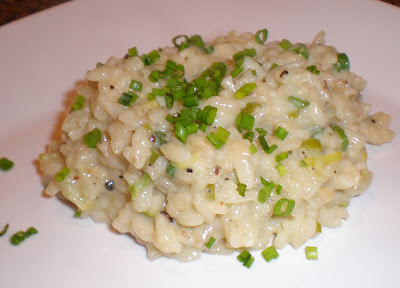 When the rice is tender to the bite but slightly firm in the center and looks creamy, about 20 minutes, remove from the heat and add the cheeses. Stir until combined. Add the remaining spring onions. Taste - season with salt and pepper. Add more chicken stock to create a soft creamy texture. Top with chives and serve.